2011 | 3rd Qtr | Media & Marketing Industry - Berkery, Noyes & Co., LLC. The most active acquirer through Q3 2011 was Publicis Groupe SA with 17 acquisitions, including the acquisitions of Schwartz Communications, Inc., and DPZ during Q3 2011. Publicis Groupe SA also became majority stakeholder in Big Fuel Communications, LLC, and Spillmann/Felser/ Leo Burnett. The largest Q3 2011 transaction was Bloomberg L.P.’s acquisition of BNA, Inc. for $963 million. There were 124 financially sponsored transactions in the 1st 3 Quarters of 2011, with an aggregate value of $8.74 billion, representing 12 percent of the total volume and 24 percent of the total value, respectively. Total transaction volume in Q3 2011 increased by 14 percent over Q2 2011, from 305 to 348 transactions. Total transaction value in Q3 2011 decreased by 23 percent over Q2 2011, from $13.5 billion to $10.4 billion. 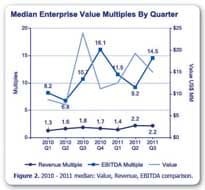 Median EBITDA multiples rose from 9.2 to 14.5, a 58 percent increase. Median revenue multiples remained the same at 2.2 times revenue. This continues to be the highest median revenue multiple over the past seven quarters. The acquisition of BNA, Inc. by Bloomberg L.P. represents a 2.9 revenue multiple and a 14.5 EBITDA multiple. The top ten deals by value have seen three new additions since our half year report. 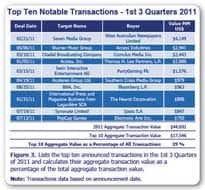 The announced acquisitons from Q3 2011 include Bloomberg L.P.’s purchase of BNA, Inc., Ipsos S.A.’s purchase of Synovate Limited, and the acquisition of PopCap Games by Electronic Arts Inc. 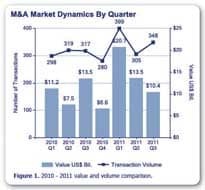 These three acquisitions, with an aggregate value of $2.6 billion, represent 6 percent of total transaction value in the 1st 3 Quarters of 2011, and 25 percent of Q3 2011 transaction value.